Without recourse to false sentiment or ironic posturing, the poems of Wayward Shadow stay resolutely tuned to the mind’s unruly registrations, as Holsapple taps into the home phone of his divided self. Grounded in the spare and lonely vistas of his New Mexico homeplace, the poet/auditor seeks, in the realities of dailiness and the surfacing of recalled moments, elusive hints of transformation and lasting satisfaction. An insistent life force and ethical temper accompany these unflinching acts of witness. 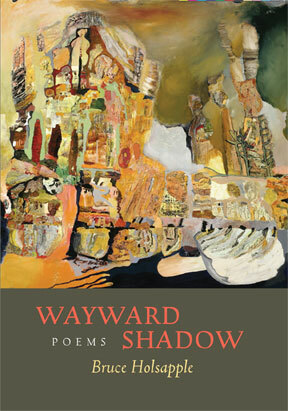 Bruce Holsapple’s Wayward Shadow pulls the reader into a brilliant mind-flow that twists like the grain of split juniper and reads like a palm held open: life-line, fate, future, and the line of unseemly events that gives us our identity. Mind, heart, and a sharp eye mark every page.